It feels as though the last year has flown by incredibly fast but we have managed to get a lot done and are very thankful for all the support we have received along the way. This document is a run through of the progress we made in 2017, an update on a few of the tasks we’re currently working on, and concludes with some of our hopes for 2018. 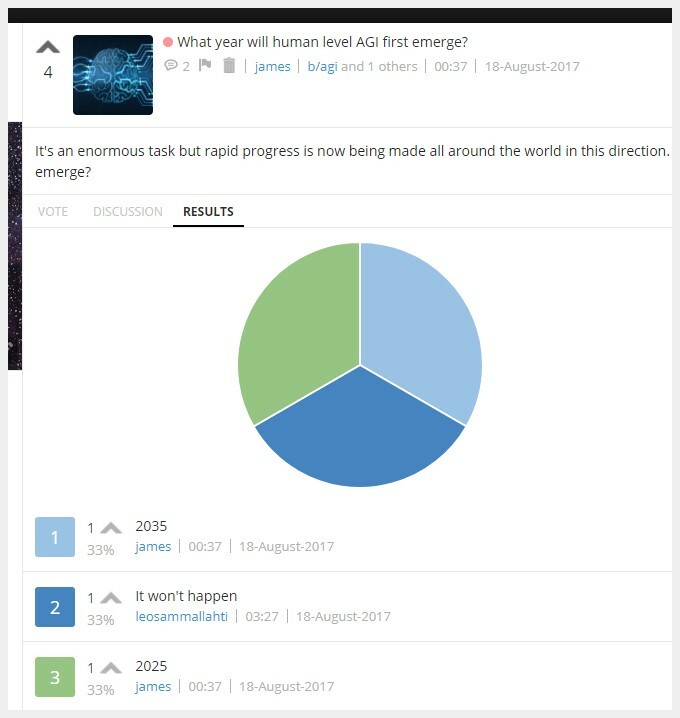 By the end of 2016 we had the underlying framework for Weco in place; it was possible for users to create accounts, set up and moderate new branching structures, submit posts and comments, vote on posts and comments, and rearrange content by its popularity or the date it was posted. Beyond those basic features, however, the site didn’t yet have much other functionality built in and there had only been a small opportunity for other users to test out the design. The initial funding I had donated to the project to get it started was also beginning to run low so we were on the lookout for new investment. In January of 2017 we were then fortunate enough to be introduced to the incredibly generous Namaste Foundation (FB page) in California who give away philanthropic gifts each year to support non-profits working towards a positive impact in the world. They believed in our vision for a more ethical social news platform enough to offer us the seed funding we needed to keep the project evolving in 2017. Allowing users to create and submit polls has always been an important feature of Weco’s design for us. Once available and being used, we believed they would help communities on the platform to measure opinions, make group decisions, and collate useful resources, among other uses. We also wanted to harness polls ourselves to gauge the opinions of our user base so that the governing decisions we made as a platform would more accurately reflect their interests. For these reasons, we decided to focus on getting this feature built in as our first priority for the year. Having completed this task, users are now easily able to create and post their own polls to any branch on the site. When creating a new poll, you have the option to include a text description along with the title and thumbnail image, submit your own answers, and then ‘lock’ your answers so that other users are unable to add more, or leave them ‘open’ so they can add their own. Each poll has three main sections: The Vote page, where users can vote on the available answers or submit their own. 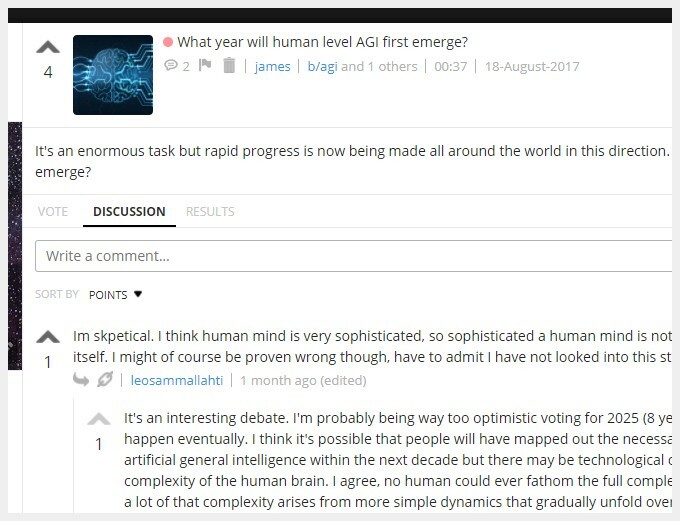 The Discussion page, which contains a comment thread for any discussion related to the poll. And the Results page, where the results for the poll are displayed as a pie chart above a list of the answers ranked by popularity. Our user interface was initially designed for desktop displays but, given how many users now browse the web on mobile devices, we knew it was crucial to get the platform working smoothly across all screen sizes as soon as we could. This involved working out how the positioning of content on the site would shift at different breakpoints in display resolutions and making sure every component scaled correctly with the rest of the template. We now have this working across all screen sizes. 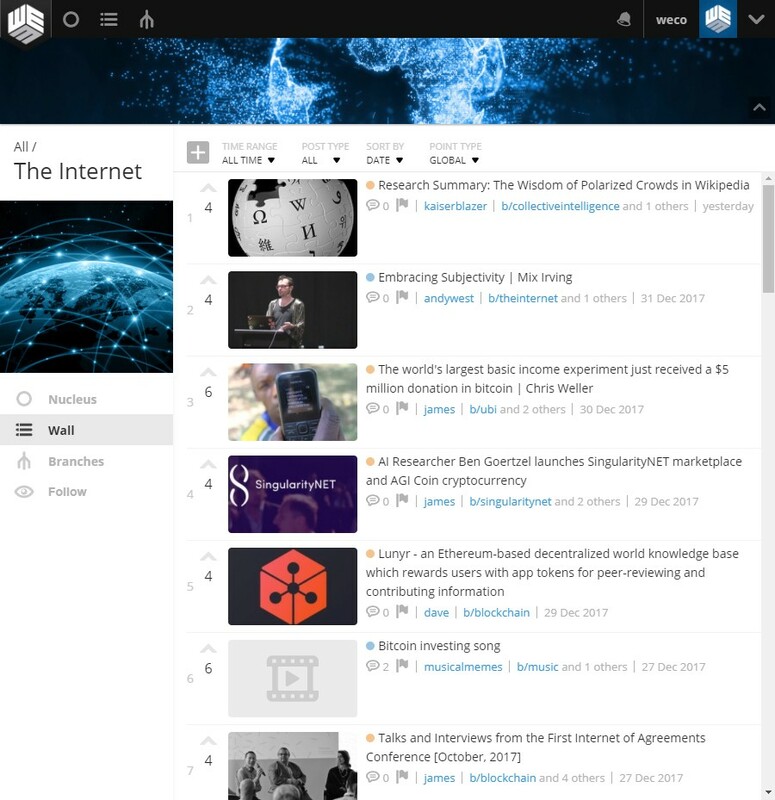 On smaller screens, the grey background disappears and the side bar is hidden from view by default until the user manually expands it, leaving more space to display content on the main wall. As the number of branches and posts on the site has increased we’ve been able to more thoroughly test out in practise many of the unique complexities that arise from Weco’s ‘fractal’ architecture. Because the content included within a child-branch is integrated in (often multiple) higher branches, the consequences of every change made at one level needed to be thought through and tested at every other connected level to ensure the system works together effectively across all levels. In particular, we had to work through how post statistics, changes to posts made by moderators, and changes resulting from branches moving locations were propagated up the branching hierarchy. This resulted in a few important tweaks: an update to the way tags associated with branches are changed when they move locations and an update to the way branch stats are calculated when one of their posts is removed by a moderator. After lots of discussion, we decided to remove the ability to down-vote posts and comments on the site. Our reasoning was that different users on Reddit use the down-vote button in very different ways; most users only down-vote content they think is inappropriate for the SubReddit it has been posted to but some will down-vote everything they dislike or disagree with, even if it is relevant to that community. Because there are no rules about how the down-vote should be used, a disproportionate amount of voting power is therefore allocated to those who use the down-vote more often than those who don’t, which ends up subtly encouraging ‘trolling’ behaviour in communities by design. Having seen how discouraging it can be for users to have their posts to a relevant community prevented from being seen by a wider audience because a small minority in the community decided to actively down vote it, for no other reason than that they disagree with the point being made, we felt it was important to find a way to tackle this problem on Weco. Eventually we decided that the best move would be to remove the down-vote altogether, as is already the case on many other social media platforms (Facebook, Instagram, Twitter etc. ), and instead give users the option to ‘flag’ inappropriate posts in a variety of ways. That way, if a post is deemed to be inappropriate by a communities moderators after the users have flagged it they can still choose to remove it from the branch. It’s just no longer possible for a small portion of users to squash content that the moderators and other members of the community deem to be relevant. All of that said, we have left the down-vote functionality intact but disabled on the back-end so that if our user base eventually decides that the platform as a whole would benefit from re-introducing it, the option is still there for us to consider again in the future. Beyond those changes, we’ve recently begun drafting several other future UI updates that we will present to our users for more feedback before adopting. 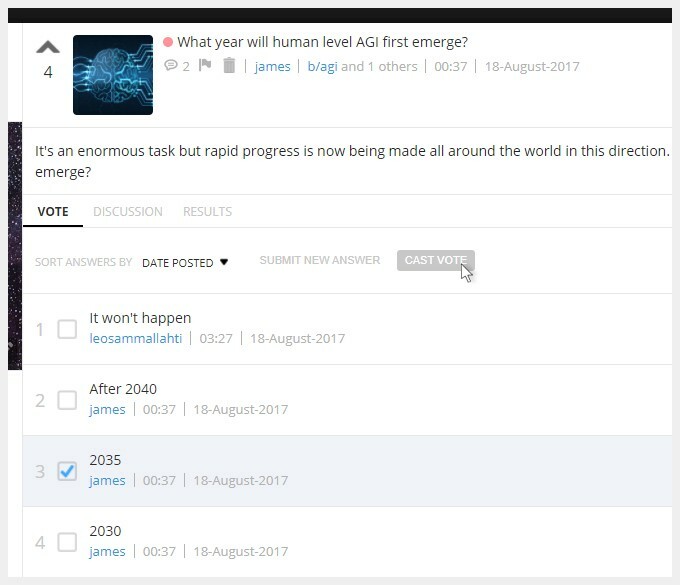 These include new designs for the layout of posts, comment threads, the ‘create new post’ form, and the Nucleus of each branch. There has been an almost endless list of other small UI tweaks and bug fixes that have gradually moved the platform towards a more functional form over the year but it would take up too much space to list them all here extensively. If you’re interested in finding out more, send a message to questions@weco.io and we could give you permission to browse our Trello task board. During this time I’ve been putting together a couple of short animations that introduce new users to the site and convey some of the core principles that underlie what we’re trying to achieve with the project. All the pages on our landing site have been updated and rewritten to add clarity and ensure that all the information and images used are up to date with the latest version of the site. It hasn’t been promoted yet but we now have a funding page set up on Open Collective ready to receive donations from anyone who would like to support the project. Open Collective works in a similar way to Patreon, except it’s more geared towards supporting open source projects and cooperatives with added tools to enable transparent budgeting. 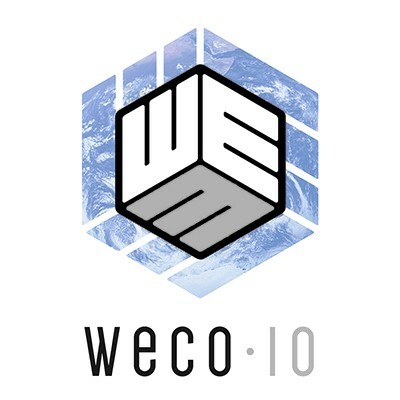 We’re planning to add a link to our Open Collective account on the Weco homepage soon as a reminder to our users that we’re a non-profit company and would benefit from their support, no matter how much they are able to offer. We very recently made our entire codebase open source on GitHub using the AGPLv3 licence. Anyone who is interested can now download and use our code however they please. Since taking this step and posting about it in a number of different online communities, we have be fortunate enough to have several developers come forward to offer their help with the project for free. Our hope is that this added support will enable us to move the project forward at a faster pace, with more combined skill and intelligence in 2018. In the last few months, having wrapped up several tasks that have resolved small issues we were experiencing on the platform, we have begun promoting Weco on Reddit again. The response has generally been quite positive so far. We managed to attract over 100 new users to sign up and try out the beta in December and plan to continue posting to new and larger communities in the coming year. If anyone is interested, they can follow my posts and the discussions they’ve generated on my Reddit account. We’ve been fortunate enough to gain several dedicated followers this year that have joined our Slack team and have been working closely with us to help us strategize how we can promote the site to new users further afield online. So far they have helped us to draft a number of posts to the social.coop group on Mastodon and Loomio, reach out to a range of YouTube vloggers, and have been experimenting with paid advertising on Facebook and Google. Beyond those efforts, it’s also been a great encouragement for me and the rest of the team to have others freely join in with our discussions and make such an effort to support our work. Search functionality — We have now mapped out how search functionality will work on the site and have begun taking the first steps to implement it. A more in depth explanation with mock-up images can be found in this public document. We were originally planning to build it on Algolia but have since decided to use Elastic Search, a free and open source alternative. We believe search functionality will add an enormous amount of value to the platform as it will greatly speed up the time it takes for users to find the posts and communities they are interested in without forcing them to navigate through the branching structure unnecessarily. Auto-suggested thumbnails — To add a thumbnail image to any post type, except image posts, on the site a user currently has to upload an image saved to their device. Unfortunately this has meant that many new users have not bothered adding images to their posts, resulting in some sections of the site looking fairly bland and un-engaging. To solve this problem our developer has begun building in a feature that will automatically scrape URL links added to posts for valid images that can be auto-suggested to users as the thumbnail image. Transitioning to a true cooperative company structure— For a long time we have had the intention of eventually transitioning to a co-op company structure but weren’t sure when the best time to make that leap would be. We’ve recently come to the conclusion that it would work in our favour to speed up that process and so have just begun taking the first steps to set that transition in motion. We believe it will make our ethos and intentions for the platform clearer to new followers, encourage more people to get involved in our decision making process, help us to promote the site amongst the growing platform co-op scene, and open up new doors for investment. Looking back on the year as a whole, some aspects of the work have taken longer than initially expected but we have continued to move forward at a good pace in-spite of the setbacks and have successfully laid the groundwork for future growth. The number of users signing up to try out the beta has slowly but steadily risen over the year and many of the new users have been offering feedback and adding to the content on the platform. There is now more being posted each day and far more to explore across the branching structure, making the platform as a whole more attractive to new users. We’ve also been greatly encouraged by the number of positive comments and enthusiasm we have received from so many. There is no doubt that Weco is still very much in its infancy as a platform; we have a tiny fraction of the users you would find on any of the established for-profit giants that currently dominate the world of social media but it’s clear that more and more people are gradually becoming dissatisfied with the status quo and have begun looking for alternatives. 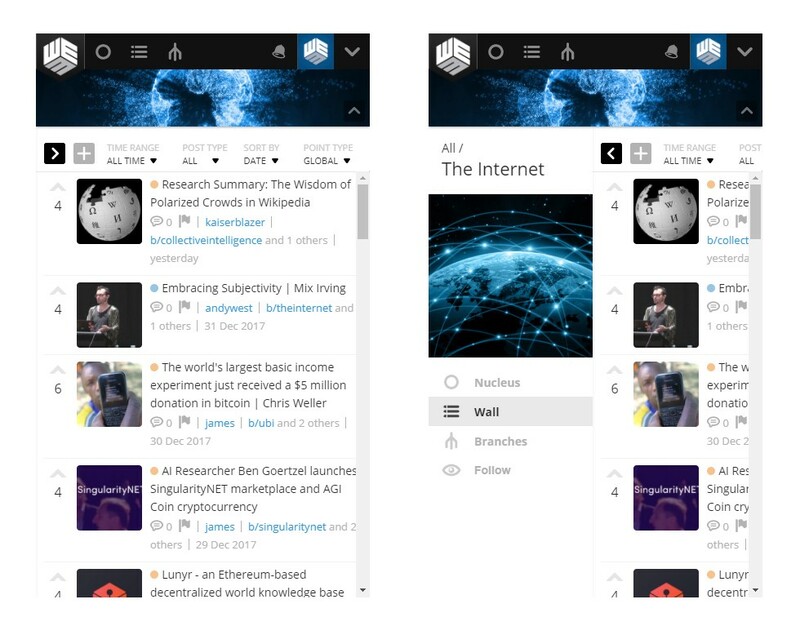 Whether or not Weco ends up gaining the traction it needs to scale up and become a viable alternative to Reddit in the coming years, I have no doubt that a platform with a similar design to ours and a desire to empower its users before its shareholders will one day rise with enormous success to out compete all its privately owned, profit driven competitors, and it will be a great day for humanity when that happens. Bring on board more users and build more of a community on the platform — Now that enough of the features are up and running and we’ve been encouraged by the response we’ve received so far on Reddit, we will be focusing more time this year on bringing on board new users and working to develop a more active community on the site. This will involve posting more frequently to relevant communities on Reddit, Facebook, and further afield, developing our search engine optimisation, experimenting with a broader range of advertising methods, drafting several new articles that explain more about our vision for the project, updating our social media channels more frequently, and posting more engaging content on Weco. Evolve the code base — As the number of users testing out the site is increasing and other developers are now able to explore our open source code base, it is becoming quicker and easier for us to find errors and improve the efficiency of the platforms design on the back-end. We’re keen to continue this process as we learn more and plan to improve the documentation for the code base so that it’s easier to update and more accessible for other developers who want to get involved in. Build an official Weco app — Quite a few of our users have now suggested that we should begin developing a Weco app to make the site more accessible on mobile devices. We agree that this would be an important step forward for the platform and would further increase the range of users who can easily access the site, so would like to work on this in the coming year if we have the opportunity. Personal walls — This a very simple feature that we believe would add a lot of value to users experience on the platform. We would insert a new wall on every users profile page that would integrate posts from all the branches they currently follow into a single news feed, providing them with an easily customisable feed based around their own specific interest. User to user messaging — This would give users the ability to send private messages to other users on the site. Tagging usernames — This would allow users to tag other users in comments and post descriptions by typing ‘@username’. The tagged user would then receive a notification with a link to where their name has been tagged. Sticky posts — This feature would allow the moderators of a branch to manually fix any post they like to the top of their branches wall. Editing post tags — We plan to give users the ability to edit the tags on their posts after they have been submitted. New wall filters — As the number of posts on the platform increases we would like to introduce several new wall filters that help users find the content they’re looking for faster. These would include ‘Hot’, ‘Rising’, and ‘Controversial’ filters, as seen on Reddit, among others. Advanced polling tools — The ability to add images and markdown formatting (including external links) to poll answers, create multiple choice and weighted polls, include a time-graph that displays how poll results have changed over time, allow users to filter comments on polls by their users vote on the poll and other meta-data, and integrate a means of verifying accounts so that polls can be filtered to only show the results of verified users. Decision trees — This is a unique tool we’ve designed that would make it possible for groups of any size to weigh up and visualise the popularity of multiple strings of connected decisions in a single location. Find out more about their design and potential applications here. A reputation system — This would be an optional feature users could toggle on and off that would track the amount of karma points users have accumulated in each community and then enable new ways of ranking posts based on their reputation scores. Find out more here. Organelles — These would be like optional installable apps for communities that could eventually provide an unlimited range of additional features for communities to use. Find out more about the ideas we have for organelles here. If you’ve got this far, thanks for taking the time to read such a long update. Hopefully it has given you a better understanding of the work we’ve been up to in 2017 and where our sights are set for the future. It’s been an exciting year for us, despite all the hard work and challenges, and it looks as though things will continue to move forward at a faster pace in 2018. Thanks again to everyone who has offered their support, in particular the Namaste Foundation and those who have been working closely with us in our Slack channel. We wouldn’t have got this far without you. I hope this next year is one of great progress for Weco and all other projects that are working towards positive changes around the world.